Sometimes your worst fears come back to bite you in the rear. Case in point: In the New York Times, on October 14, 2001 the managing director of an oil consulting firm warned: "If Bin Laden takes over and becomes king of Saudi Arabia, he'd turn off the tap ... he wants oil to be $144 a barrel." Indeed, if Bin Laden's aim was to hurt the U.S. through higher oil prices, he's probably thinking "Mission Accomplished." Soaring oil prices are fueling inflation and sowing the seeds of recession at the same time. * No production boost from our Saudi 'Friends'. Saudi Arabian Oil Minister Ali Naimi said last week in Madrid that the world's biggest oil exporter had no immediate plans to boost crude output because there was no need to do so. This is a complete about-face from what the Saudis said last month -- that they would boost production by 200,000 barrels per day on top of a 300,000 barrel per day hike in May. But it doesn't surprise me, and it shouldn't surprise you. With friends like Saudi Arabia -- home to 15 of the 19 9/11 hijackers -- we don't need enemies. * OPEC President says oil market is well-supplied. On Sunday, OPEC president Chakib Khelil warned that oil prices will continue to rise. "As producer countries we think that the current supply is sufficient, that this balance in supply is in everybody's interests and that it shouldn't be disturbed," Khelil said. In other words, OPEC is in no rush to raise production. 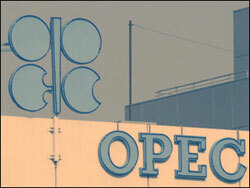 OPEC has warned that oil prices will continue to rise. Khelil went on to say that the longer-term trend in the U.S. dollar was down, adding that this would force oil prices even higher. "I believe that 60% of the rise is due to the fall in the exchange rate of the dollar and to geopolitical problems." Indeed, looking at the dramatic run-up of oil prices in U.S. dollar terms as compared to other currencies proves quite revealing. About 50% of the increased pain you feel at the pump these days is due to the falling dollar. * Production at Mexico's giant Cantarell oil field is falling off a cliff! Crude output from Cantarell, the world's third-largest oil field, is falling at the fastest pace in 12 years -- down a stunning 34% in May from a year earlier, or a loss of more than 540,000 barrels a day. The last time Cantarell suffered a production loss this bad, it was slammed by a major hurricane. A couple weeks ago, I said right here in my Money and Markets column that Mexico's oil exports could halt by the end of 2010. If Cantarell is dying, I was TOO optimistic. Naturally, falling production is curbing exports to the U.S., which buys about 80% of Mexico's oil exports. Sales to the U.S. tumbled to 1.07 million barrels per day in May from 1.4 million barrels per day in September. All in all, I wouldn't be surprised to see a sizeable pullback in oil prices -- a normal and necessary part of any bull market -- but I think we're on a collision course with Peak Oil. As oil prices climb ever higher, businesses have to pass along the cost. Example: My cousin Peggy and her husband Gary run an invisible fence (electronic collars that keep dogs in the yard) company in Maine. The fuel costs of their vehicles jumped $9,000 in the first half of the year. "Are you going to raise your prices?" I asked Gary. "Oh yeah," Gary replied. "Everybody is. We have to pass along the cost of gasoline." Indeed, it's not just Gary. On my most recent trip, I saw major airlines, taxi drivers, buses and small mom-and-pop restaurants all raising prices. And the financial impact of higher oil prices goes far beyond fuel and food purchases. Thousands of products Americans buy every day -- from toothpaste to deodorant, CDs to computers, clothing to furniture, shampoo, shaving cream and plastic cups -- all contain oil. According to the American Petroleum Institute, a little more than one gallon of each barrel of oil goes into such everyday products as toothpaste, house paint and cosmetics. Since we use over 20 million barrels of oil per day, that means we're burning through 20 million gallons a day before ever firing up our engines. Manufacturers of everything from wallpaper to cereal are feeling the pinch. The Institute for Supply Management said last week that its index of prices manufacturers pay for raw materials hit 91.5 in June, up from 87 in May. That's the highest reading since inflation exploded back in 1979. We're witnessing a classic domino effect; every time oil hits a new record high, the price of nearly EVERY product and service in the U.S. goes up accordingly. The proof: U.S. consumer prices surged 4.2% year-over-year through the end of May. I expect rising energy prices will continue driving the cost of most goods and services higher and higher. 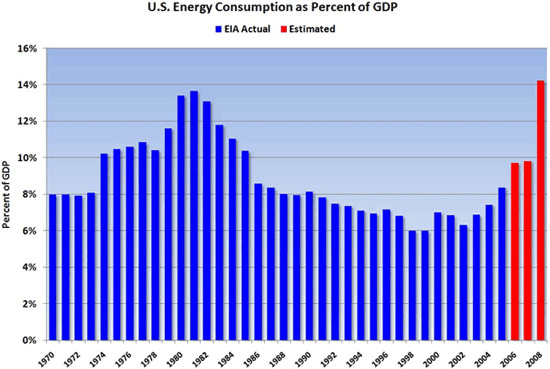 According to the brainy folks who run the Calculated Risk website, energy consumption as a percent of U.S. GDP will rocket to over 14% in 2008 -- a new record. But the Energy Information Administration data shows that, in June, oil demand in the U.S. fell by nearly 400,000 barrels a day from a year earlier, to 20.342 million barrels a day. That is the weakest demand level for all of June since 2003. How can oil prices go up when our domestic demand goes down? Because people in China, India and the rest of the developing world are lining up to buy every barrel of oil we don't use ... and then some! This brings us to a strange conundrum where U.S. consumers could experience both red-hot inflation and a recession at the same time. Not all prices are going up. One sector where consumers have a choice whether to buy or not is going down ... way down. The latest S&P/Case-Shiller index of home prices in the 20 largest U.S. markets fell by a record 15.3% in April from a year earlier, accelerating from March's 14.3% drop. The Labor Department in Washington said the U.S. economy lost 62,000 jobs in June -- dropping for the sixth month in a row -- and the jobless rate held at 5.5%, the highest since October 2004. More than 324,000 U.S. jobs have been lost so far in 2008. In the U.S., GDP growth averaged an annual rate of only 0.8% in the six months ended March 31, the weakest six-month performance in five years. The Organization for Economic Cooperation and Development recently cut the growth forecast for its 30 members to 1.8 percent for this year, which would be the slowest rate since 2002. Perhaps most damaging of all is the fact that 75% of Americans think the U.S. is already IN a recession! Why? Despite all the dollar pep-rallies in Washington, millions of consumers have gotten wise to the fact that instead of getting the federal budget under control and aggressively battling inflation, the U.S. government is simply printing money with reckless abandon. As a result of this artificial State stimulation, the dollar has gotten creamed. Consumers' purchasing power has come under assault. Inflation has skyrocketed. And if the court of public opinion is to be believed, we're in a recession. As I mentioned earlier, 50% of the rise in oil prices this year is attributed to the fall in the U.S. dollar. So until Congress, the White House and the Federal Reserve finally get their act together, I think you can expect to see more of the same. #1) Hedge your fuel costs like the airlines. Autoweek reports that a company called MyGallons.com lets members buy gasoline via its website at a predetermined average price for the area where they live. The gallons are loaded onto a debit card that the company says is accepted at more than 95% of the nation's fueling stations. MyGallons charges members an annual fee of $29.95 or $39.95 for the service. Based on how many gallons you buy, the service sends you a debit card that lets you purchase as much fuel (per gallon, not dollar) as you have stored up. So let's have some fun with math. Let's say you think the price of gasoline is going up an average 50 cents in the next year, and you drive 12,000 miles a year in a car that gets 24 miles to the gallon. That means you'd use 500 gallons in the next year, and if you're right about the price rise, you'd pay an extra $250 for gasoline over what you pay now. So, it might be worth your while to hedge your fuel costs. The MyGallons concept is similar to Chrysler's current program that promotes a set $2.99 a gallon for fuel for three years. Chrysler's program limits the guaranteed fuel price to the equivalent of 12,000 miles per year, whereas MyGallons members can buy as much fuel as they need. MyGallons launched a pilot program in April, and estimates that the testers paid about $3.10 a gallon for gas, saving roughly a dollar over today's prices. Just remember, gasoline prices can go down as well as up, and if you hedge too much at too high a price, you'll rue it later. The MyGallons program is something you can do right now to lock in lower prices if you think oil and therefore gasoline are going higher. With energy and inflation ramping up, you'll also want investments that will rise with both. Select energy stocks could be a good bet, but many stocks will get killed in a recession. So here are a couple of exchange-traded funds that track oil and gold. #2) iPath S&P GSCI Crude Oil Total Return (OIL). This ETF tracks oil prices closely (but not exactly). It's similar to another favorite of mine, the United States Oil Fund ETF (USO). Both offer easy ways to get direct exposure to rising oil prices. #3) SPDR Gold Shares (GLD). Formerly known as StreetTracks Gold ETF, this exchange-traded fund holds physical gold and tracks the metal very closely. Gold is another commodity that is priced in dollars, so as inflation takes off and the value of the dollar goes down, gold should go up. Money and Markets (MaM) is published by Weiss Research, Inc. and written by Martin D. Weiss along with Tony Sagami, Nilus Mattive, Sean Brodrick, Larry Edelson, Michael Larson and Jack Crooks. To avoid conflicts of interest, Weiss Research and its staff do not hold positions in companies recommended in MaM, nor do we accept any compensation for such recommendations. 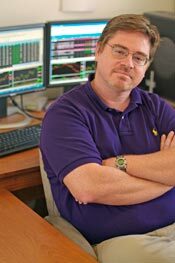 The comments, graphs, forecasts, and indices published in MaM are based upon data whose accuracy is deemed reliable but not guaranteed. Performance returns cited are derived from our best estimates but must be considered hypothetical in as much as we do not track the actual prices investors pay or receive. Regular contributors and staff include Kristen Adams, Andrea Baumwald, John Burke, Amber Dakar, Dinesh Kalera, Christina Kern, Mathias Korzan, Red Morgan, Maryellen Murphy, Jennifer Newman-Amos, Adam Shafer, Julie Trudeau and Leslie Underwood.